This week’s big event is a big one, indeed. On Tuesday 10 October, expansive Jupiter ends its 13-month reign in Libra and glides into deep, mysterious Scorpio, where it will stay until 8 November 2018. Relationships. Singles, keep a lookout: Jupiter in Scorpio is a good time to find a mate and establish a committed relationship. Must be all that Scorpionic possessiveness + passionate intensity. Be sure to establish boundaries + space to breathe: control issues are not cool. Finances. Scorpio rules joint finances, properties, wills + inheritances, savings + investments, and the gig economy! Exciting times for new + innovative entrepreneurs, yes? This is an advantageous time to get your finances sorted out and get that sideline startup going. Spirituality. Scorpio rules esoteric spirituality, mysticism, and the occult. It’s an energetically powerful time to explore your psychic abilities and learn more about the Spirit realm. As with all things Spirit, be careful and use your common sense. Don’t blindly go for any workshop and accept some so-called guru’s DNA activation or Angelic attunement or whatever they’re selling, unless it actually resonates with you. Do your research! Stay tuned in 2018, mystic explorers – I’ll be rolling out workshops and materials on psychic development + protection for you! LEFT: JUSTICE REVERSED. If you’re currently stuck in a situation that doesn’t seem to be benefiting you, hold off on making any drastic decisions. It could be that you don’t have all the information you need. This is also not a good week to start a fight, no matter how justified you think you are. MIDDLE: THE TOWER REVERSED. As one of the dark cards of the Tarot, The Tower is feared as a harbinger of crisis + destruction. It’s not always the case, though: here, the reversed Tower is a reminder that if you must confront a situation this week, be compassionate and gentle in your approach. Focus on shared values + perspectives, building + rebuilding. Keep calm. Things are not as bad as you fear. RIGHT: TEMPERANCE REVERSED. When Temperance flips upside-down, control issues are messing up your situation. It’s time either for you to get a grip on reality, or to loosen your grip on things! Temperance indicates the wisdom of moderation, so when this card appears ill-dignified, beware of extreme approaches. Burying your head in the sand, playing the victim, or going nuclear-level aggressive will not solve your challenges. BE BLESSED: THE FATES. When this card appears, understand that not everything is within your control – and be glad for it. The lesson here is that you can only be responsible for who you are, how you act, and what you choose. It is the ego that vainly attempts to control others for our own satisfaction – rise above the desire for power + the underlying insecurities that drive this desire, and look to your own affairs. BE CAREFUL: NO PLACE LIKE HOME. This card appeared in the same position last week as well. When No Place Like Home shows up in the warning position, ask yourself if it is a dissatisfaction with yourself, a fear of the unknown, or something else that drives you to seek control over other people and situations. Do you sometimes fear that you are not good enough? Dear one, You are enough – only trust. You are your own soul’s home, and there is no one like you. BE ADVISED: YIN. This card signifies the female energy of receptivity, soft gestures, and a calm + gentle spirit. 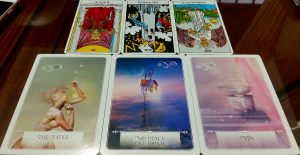 It fits in perfectly with the Tarot’s message to avoid picking fights, and to focus on compassion if a confrontation is necessary.